This coming Wednesday, December 25/January 7, we will celebrate the Nativity of Our Lord, God, and Savior Jesus Christ. As is well known, the “birth narratives” in the Gospels of St Matthew and St Luke are filled with one miraculous occurrence after another, which admittedly cause a great deal of trouble to many “modern,” “enlightened” readers. Of course, this difficulty is neither new nor peculiar to the modern age, and (as we would expect) Machen had some words to say on the subject. Today I have chosen to post the main thrust of his comments, and in later “Saturdays à Machen” I will expand on their context, which elucidates his argument. “. . . It may be admitted that miracles conceivably might occur. But have they actually occurred? This question looms very large in the minds of modern men. The burden of the question seems to rest heavily even upon many who still accept the miracles of the New Testament. The miracles used to be regarded as an aid to faith, it is often said, but now they are a hindrance to faith; faith used to come on account of the miracles, but now it comes in despite of them; men used to believe in Jesus because He wrought miracles, but now we accept the miracles because on other grounds we have come to believe in Him. I’m slowly coming to realize how “meet and right” (sorry, redundancy police!) it is for you to venerate this teacher and scholar. 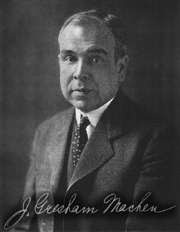 May God send us more Machen’s! But Nick! Don’t you realize the enormous importance of the emphatic use of the word today? This is true both of the Epistle to the Hebrews and liturgical texts, both Eastern and Western. ;-) Thanks for catching that! My proofreading (which was never great anyway!) has suffered greatly from my lack of internet–and the mall WiFi is now broken, to boot! Zac, it is meet and right not only that I should revere Machen, but that all should do likewise! May God send us more like him, indeed.